Even devoted fans of Vaughan Williams’s music may not recognise The Bridal Day, a masque composed in 1938-39, as the prototype of Epithalamion, his choral cantata of 1957. The initial redaction of the work had a narrator to recite Edmund Spenser’s verse, as well as mimers and dancers. This new recording is the only version currently available in the catalogue. Fortunately it is a very good one. The septet of players from the Britten Sinfonia ensure that Vaughan Williams’s music, by turns playful, lithe and sensually alluring, is winningly projected, and the baritone Philip Smith contributes warmly. Crucially the speaking part is judged perfectly by John Hopkins, who successfully avoids the hamminess that can easily result in mixed-media pieces. This new release does a valuable service in bringing The Bridal Day back into circulation. Enthusiasts will, I fancy, enjoy spotting the kindred stylistic links with a number of key works, not least that spellbindingly original and sensual masterpiece Flos campi (1925). Alan Tongue masterminds outstandingly sympathetic accounts of both these rarities, drawing an enviably secure and consistently stylish response from the Joyful Company of Singers and members of the Britten Sinfonia, and there are also memorably eloquent contributions from speaker John Hopkins and baritone Philip Smith. Top-notch production values, too, from the expert team of Andrew Walton and Mike Clements. There is much attractive music in both versions but rather more of it in the original [The Bridal Day], (and the speaker is not a stentorian old fogy but rather a young man speaking in a normal tone of voice) and the solo viola will recall 1925’s Flos Campi while the flute has some beautiful bird-call material. 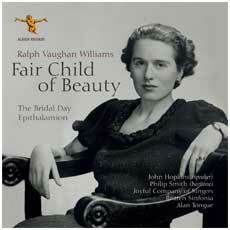 Vaughan Williams enthusiasts shouldn’t hesitate! The story that ties these two related works together centres on an attractive 27-year old poet named Ursula Wood who sought a meeting with RVW in 1938 to suggest a collaboration with him. The remarkable first musical fruit of that meeting of minds and hearts, a masque called The Bridal Day, is contained in this release from Albion Records. In 1957 RVW reworked the masque into the relatively more familiar cantata for chorus, baritone solo, and string orchestra with flute and piano, named Epithalamion to distinguish it from the earlier work. Only a small amount of new music was added, but the celebration of marriage, no doubt of ever greater significance as he delighted in his May-December union, draws a special autumnal glow in the adaptation, especially in the later choruses. This is, as must be clear, the first commercial recording of the masque, and only the third of the cantata. It would be a valuable release then, even if the performances were less accomplished than they are. Conductor Alan Tongue leads both works with energy and perception. I wholeheartedly welcome this new recording. It is notable for the infectious freshness of the performances: the excellence of the Britten Sinfonia and the splendid septet drawn from its ranks, especially the fine violist Clare Finnimore in her solos; for the lovely and characterful singing of the chorus, quite perfect for the masque; and for the youthful ardour of baritone Philip Smith. Actor John Hopkins, whose reading of Spencer is almost music itself, adds the appropriate sense of occasion to the festivities in The Bridal Day. This is a mandatory purchase for all lovers of Vaughan Williams’s music: for the too-long neglected masque, and for the fine performance of the cantata.